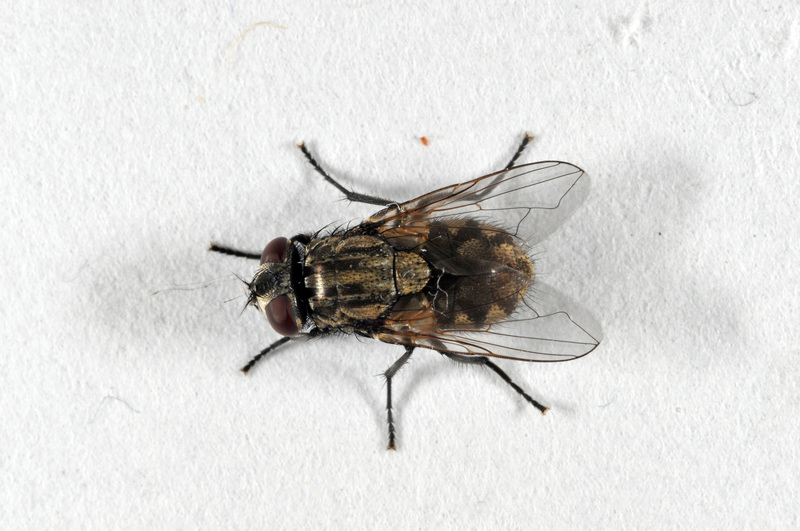 During most of the year, nuisance flies are not a problem to structures. In the late fall, these flies leave their breeding sites and seek out structures to occupy during the cold winter months. If the flies stayed in their overwintering spots we would typically not even know they were there. However, during warm periods throughout the winter, the flies become active and are attracted to light. This is when the building occupants notice flies in light fixtures and buzzing around windows and seek assistance to rid the structure of flies. Cluster Flies: These are medium size gray flies (1/4-3/8”) that belong to the same family as blow and bottle flies. The key character is the presence of golden yellow hair on the front top of the thorax. These can be easily seen with a 30x hand lens. Adults hold theirwings flat over back while resting and wing tips overlap. When captured, adult flies give off an odor like buckwheat honey. Face Flies: These are medium size gray flies (1/4”), very similar to house flies. Like house flies, prothorax has 4 dark stripes, and the fourth longitudinal vein has sharp curve toward the leading edge. To distinguish from the house fly, the calyptere (flat appendage found just behind the wing) is not bare and contains tufts of bristles or hairs where it attaches to the thorax. Cluster flies are parasites of earthworms and breed outdoors in lawns and fields. Females lay eggs in cracks in the soil. After egg hatch the larvae seek out earthworms as their source of food. Adult flies feed on flowers. Cluster flies are a problem when the adults begin to seek protected overwintering sites in late August and September. They are attracted to warm (often south and west) walls of buildings. Once on the building, adults search for cracks to gain entry into the structure. Most infestations occur in the upper areas of a building (attics, upper floors). Unseasonably warm periods during the winter allow the adults to move about. This is when the cluster flies are most noticeable. They are strongly attracted to light. Face flies are generally found on cattle farms since they breed in fresh cow manure. Structures that are located near rural areas are most likely infested by face flies. Like cluster flies, face fly searches for overwintering sites during late August and September. They seek out warm voids within the building, often huddling together in large masses. Once inside a living area of the structure, they are usually attracted to lights or windows. 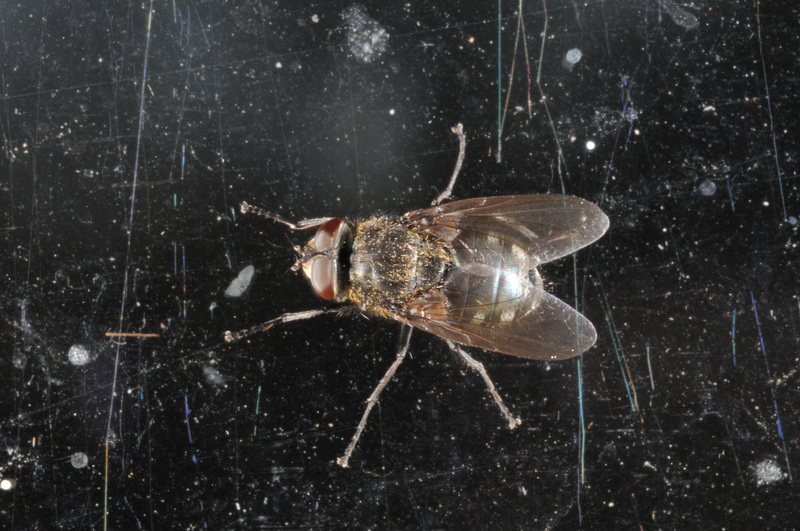 Since the breeding source is outside the structure the primary goal of a nuisance fly inspection is to find the cracks and crevices that allow them entry into the structure. This is a very difficult task. Start with the south and west side of the structure. Look for exterior cracks that the fly might use to gain entry. If the voids are accessible, look for large clusters of flies in the corners, along wooden beams, or under insulation. When inside the void, look for sunlight penetrating through the exterior walls. In very tall buildings, examine windows, vents and air-conditioning units. The most effective way to control nuisance flies is to prevent entry into the structure. This can only be done to structures that have had an infestation the previous year. Since the flies only seek out the structure once a year, preventative methods need to occur before the fall when the flies seek overwintering sites. All cracks and crevices need to be sealed tightly. A residual application (microencapsulated seem to work best but wettable powders are also effective) to the exterior surface of the structure can be made to kill most flies as they land. This application should be made just prior to the time that flies in the area start to seek overwinter sites. Once flies are inside the building, they are difficult to control. Vacuuming up clusters of flies, light traps, and the application of residual insecticides will reduce the population but not eliminate it. Cluster fly infestations CANNOT be controlled by killing earthworms. Since cluster flies are strong fliers and capable of flying considerable distances, lawn treatments are not effective.